Win 7 64-bit, Macrium Reflect Home Edition, Version 6.3 1821 (64-bit). This morning I tried mounting an image from a network drive and assign a drive letter, without much luck. It took me a while until I figured out I had to pause protection in 'Folder Guard' (not just allow full access to the drive as I would usually do). I am using Folder Guard to have my B: (backup) drive letter protected. I have defined a password for read access and another password for full access. I have also added the various Macrium Reflect EXEs as trusted (so backups run as per schedule with or without the user logged in etc - and without the need to unlock the folder manually). Macrium Reflect does have full access to the B: drive but I still couldn't mount the image. I also tried to unlock the folder for full access, but Macrium Reflect still couldn't mount the image. Only when I paused the full Folder Guard, I could mount the image. 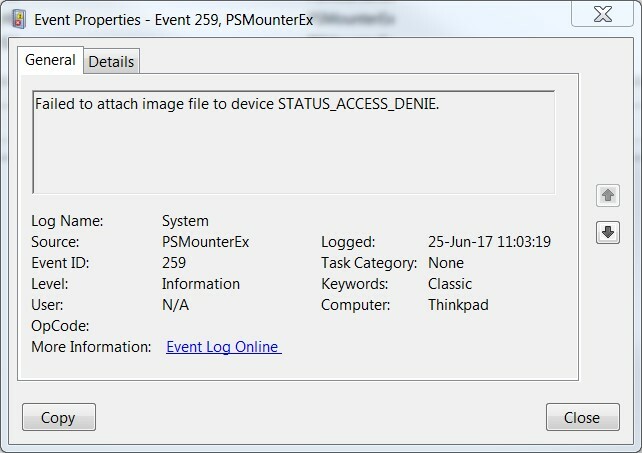 When I had full access to the image, and moved some large files to my local drive, only "System" was showing up as taking some 5% resources via Windows Task Manager. Am I right to assume that PSMounterEx is part of Macrium Reflect? What permissions would I need or what program would I need to add as Trusted to make this work without unlocking? I also assume Windows permissions are not involved in this problem, as I can mount the image to a drive litter by simply pausing protection within Folder Guard. I assume it's simply another process that tries to access/mount the image, or Macrium Reflect uses another Windows user. Images are mounted in the Windows Kernel space by the Windows SYSTEM account. I'm not sure how Folder Guard is configured, but Read access should always be allowed, only Write is a potential threat. 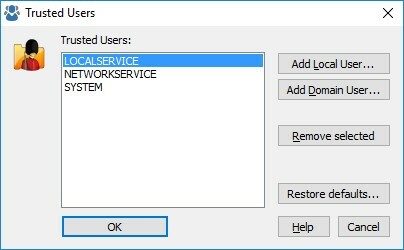 The user SYSTEM is added as Trusted User in Folder Guard by default. Going by that, it should work but for some reason it doesn't. Also, even with read access allowed (by Folder Guard) or full access (also by Folder Guard), it doesn't mount. Only when Folder Guard protection is paused it mounts the image to a drive letter. Something seems to be interfering. We have installed a trial version of Folder Guard and tried numerous different configurations, but unfortunately we were unable to reproduce this issue. You may wish to contact the support guys at Winability to see if they can provide more insight on this issue. unfortunately we were unable to reproduce this issue. thanks for looking into this. Strange that you couldn't reproduce this issue. I contacted Winability support and they are seeing what I am seeing. Seems they are going to make some changes in their next update. I have tried to investigate the problem using the trial version of Macrium Reflect. It appears that when mounting a backup image, it uses a somewhat unusual approach that causes it to be restricted by Folder Guard even though all Reflect programs are declared as trusted. We will try to recognize such a situation and improve its handling in the next update to Folder Guard. - Assign the 'Full access' attribute to this filter. Apply the changes, and from now on Reflect should be able to mount its images. Please note that 'Filters' needs a professional/business license of Folder Guard, which I don't have - I can't try this workaround at the moment but maybe it helps some other users. Also, I would probably not setup "Full access" as outlined by Winability, but rather just read access.